The planned control burn in Toll Canyon will occur on Thursday, February 22, 2018. The Snyderville Basin Special Recreation District (the District) has been actively engaged with several partnering entities to advance forest management activities among the District’s forested open space lands. Through a strong collaborative effort between federal, state, local agencies and non-profit conservation organizations, forest treatment work has fostered efforts to help improve forest health conditions and lower the risk of catastrophic wildfire. These efforts are being coordinated in conjunction with the Utah State Forest Fire and State Lands (FFSL), Summit County Fire Warden (Summit County), Park City Fire Department (PCFD), and Utah Open Lands (UOL) to expand the effectiveness of these treatments across a larger landscape area on these protected forested open space lands. This letter is to inform you that the District will be conducting slash pile burning operation in the coming weeks, between January 15 and the end of February, within Toll Canyon open space. This slash pile burning project is aimed at eliminating approximately 50 slash piles on the areas located in the Toll Canyon drainage bottom along the emergency escape road between Summit Park and Pinebrook. In 2016, a 15-acre hand treatment wildfire mitigation project was completed. Approximately 100 slash piles were generated as a result of the treatment work. Approximately 50 piles remain due to the inability to mobilize the chipper in that part of the canyon bottom. The burning of these piles is necessary as they present a fuel load that needs to be properly mitigated. The project treated an 80-foot corridor of forested open space along the emergency escape route between Summit Park and Pinebrook neighborhoods. The FFSL Hot Shot Fire Crews cleared brush and hazardous trees. In conjunction with this project, fire “breakaway” gates were installed on either end of the escape route. Gates are designed to break open when a car pushes on the gate during an emergency. This project was funded by a FFSL Summit Fire Mitigation Grant. The buffer created by this project served to reduce the volume of surrounding forest vegetation (fuels) that presented a hazard to nearby homeowners, while providing a safe exit in the case of a catastrophic fire. The intention of this project was to reduce the homeowner’s risk to wildfire and to reduce the potential for fires to start in the treated areas. FFSL crews removed beetle-killed trees and thinned dense growing conifers to improve forest health and enhance wildlife habitat in the area. Firewood rounds were provided for community collection. 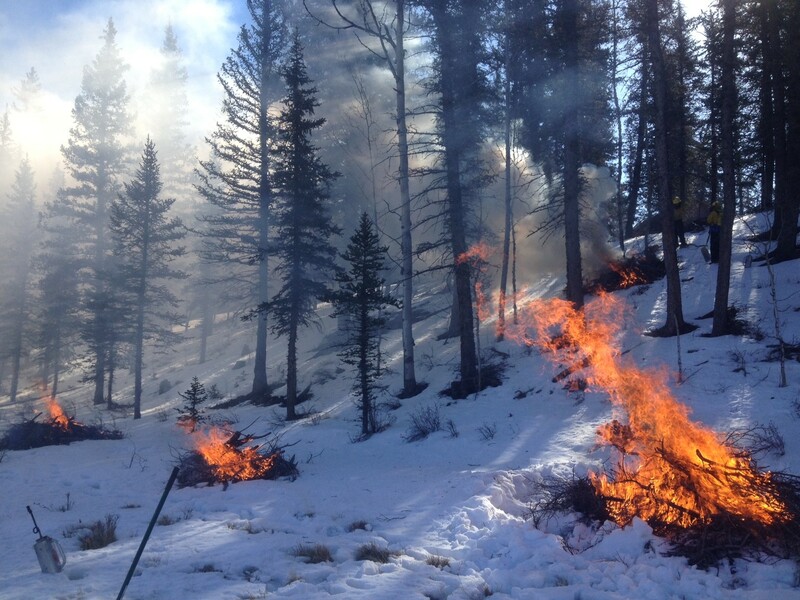 Burning operations are planned to begin in late January through late February based on the required snow cover, weather conditions and air quality regulation to ensure safety. The District’s Open Space Management Supervisor will be on site during the burn, while the actual burning will be conducted by Summit County and PCFD. All required Utah State smoke permits, local burning permits and needed air quality approvals will be acquired by Summit County for this operation. Exact burning dates will be dependent on snow cover and weather conditions. Given the location of the pile burn area (see attached maps), this burn will be low complexity operation. As required per the burn plan and permits, the appropriate authorities will be notified each day that burning operations occur. The District will be working in close coordination with Summit County and PCFD. The District is committed to the safety and well-being of the public and our public lands. Questions should be directed to Open Space Management Supervisor, Jessica Kirby, 435-649-1564 x26 or email jessica@basinrecreation.org.